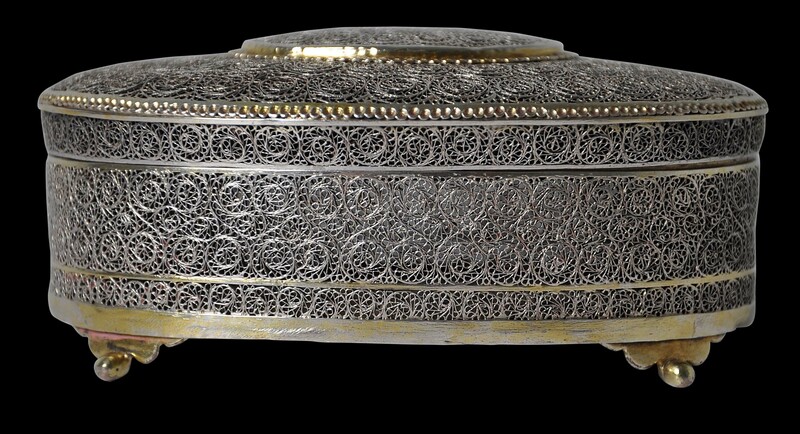 This elegant oval, lidded box incorporates the finest silver filigree work that we have seen. The tightly rolled swirls are extraordinary for their precision and fineness. 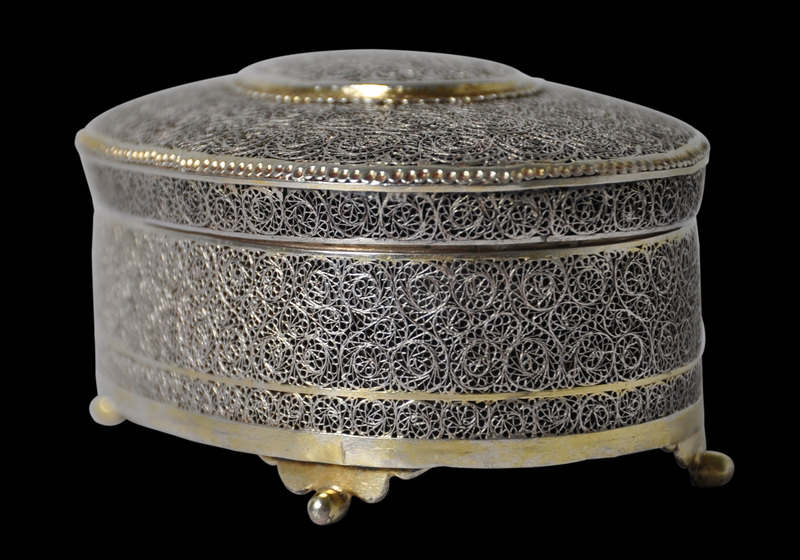 The box was for use to hold betel nut or paan, and as such served as a betel box or pandan. The cover and sides are entirely of fine filigree. The underside of the base is of sheet silver. The cover or lid is rounded and slightly domed rising to a flattened oblong top section. It has fine crenulated edging that has been gilded (gold plated). It fits tightly to the base. Unusually, the sides of the lid flare out beyond the sides of the box giving the box an overall pleasing sculptural quality. 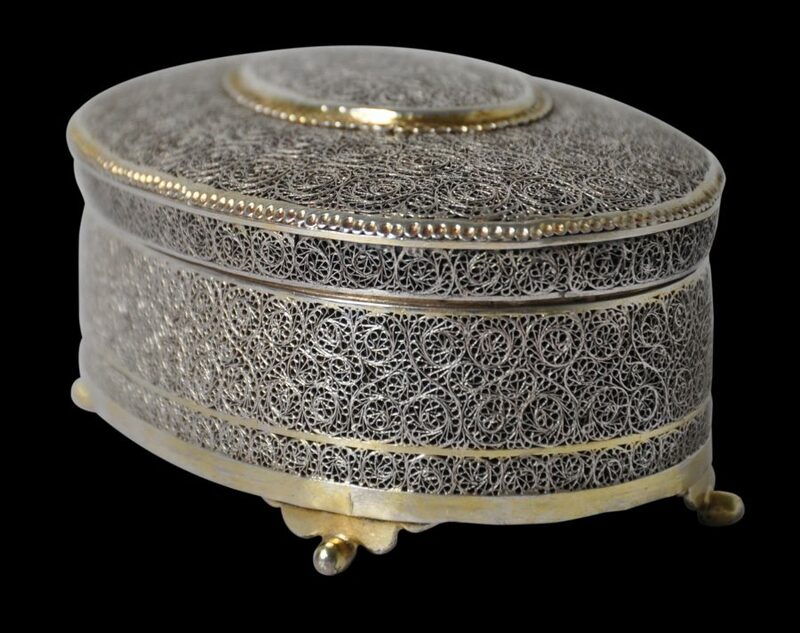 The box stands on four small gilded feet which are attached to a plain silver band that runs around the base of the box. This also is gilded, as is an additional small plain band of silver that runs around the lower section of the box. The base itself is of plain sheet silver. 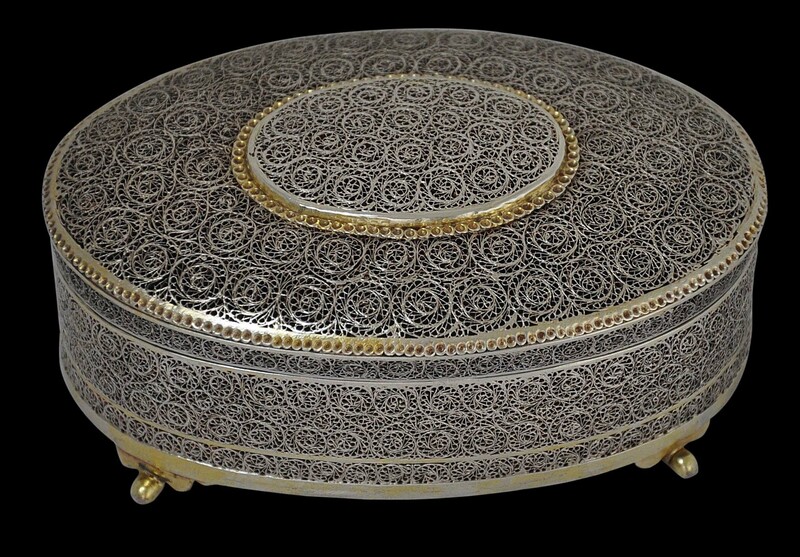 It is likely that the box is the product of Muslim craftsmen in central or northern India. The way in which the strands of filigree have been arrayed (described as scrolls of wire ‘commas’) has much in common with that on an octagonal chest attributed to early eighteenth century India which is in the Hermitage Museum and mentioned in a Winter Palace inventory of 1789. It is illustrated in Piotrovsky et al, 2006, p. 46. Another example of similar filigree work can be found on a rosewater sprinkler illustrated in Galloway (2009, p. 60). This item is in excellent condition. There are no obvious losses to the filigree and no repairs. The box is heavy in the hand. The contrast between the silver and the gilding is particularly pleasing. Overall, this is superb item showing superb craftsmanship. Galloway, F., Global India, 2009.